The Öresund Bridge spans the narrow stretch of sea between Denmark and Sweden, connecting the cities of Copenhagen and Malmö by road and rail. In autumn 2008, eight years after it opened, it was decided to replace the aged, deteriorated road lighting. 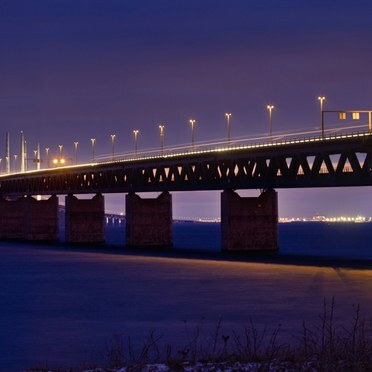 The bridge's management authority chose Thorn Victor lanterns for their lighting performance and ability to better withstand the marine environment. Just a few weeks later the first 360 lantern were supplied, complete with special optic to deliver uniform lighting across the four lane E20 highway. As the volume of traffic has increased continuously since the bridge was built, a 4.6km rail tunnel is now under construction under Malmö, linking the Central Station with the Öresund Bridge. The twin bore, single track, Malmö CityTunnel, which must also operate under hostile conditions, was lit by 342 Thorn Gotthard luminaires. The project was completed in 2011.